Ah the Summer, it feels so long ago now doesn’t it!? Well, we had an extensive list of things to do and places to go over the summer holidays involving theme parks, seaside, ice rinks, zoo, farms, meeting up with friends and lots of outdoor fun. We compiled this list before the holidays to give us options if we felt like doing something. Most of all I wanted the holidays to be relaxing and about spending time together before both boys were at school. We did actually manage most of the list: meeting up with lovely Susan and her family at Wheelgate Park, camping in Norfolk, two visits to Warwick Castle, and an evening safari to Yorkshire Wildlife Park plus numerous other days out. However mid August we had already booked to visit Granny and Gramps in Italy, in their mountain cave in Calitri – our 4th visit (Noah’s 3rd unless you count in utero). The weather last year was very hot, the only option being to head to the pool, and I expected it would be the same. In actual fact although it was still very warm but it was more bearable and this year we only made it to the pool around four times in three weeks. Rather than heading to the pool every day we visited places in the area. This was good as we learnt much more about the history and saw some amazing places. There are some great days out and fantastic things to do with kids in the area.. here are a few things we did.. Many of the towns and villages in this area are built on hills and each has its own castle. This stems from before the unification of Italy in the late 1800’s when each town was ruled by its own Lord. As such there are lots of castle to visit, many of them built by the Normans, as this area of Italy was occupied by the French. Met the We also went to visit the Buffalo at the famous Tentuta Vannulo from whose milk delicious mozzarella cheese is made. The buffalo were a bit smelly. Tentuta Vannulo is very close to the beautiful seaside of Paestum (which is a little bit of antient Greek history in Italy with ruins of temples from Greek occupation in the past). After seeing the buffalo and how the cheese is made, we headed to the beach. The sea was lovely and warm and very shallow to quite far out. The boys had great fun jumping the waves and digging in the sand. I love the Italian seaside! We also visited Laceno, which is a fabulous day out in summer or winter (the latter if you are a skier of course!) and went to a medieval night in Rocca san Felice which was awesome. Posts to follow of these days out! The husband couldn’t make it on all of these adventures as he had to work (boo hiss!) and we are now looking at a late getaway in the sun together. Will be checking out Icelolly.com for some great last minute holidays and late summer sun. Egypt is looking to be top of our list as it is still very hot there in October. 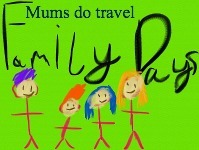 Linking up with Mums Do Travel..